commentators: Michael Howard: Why was Britain the first western country to breed home-grown suicide bombers? 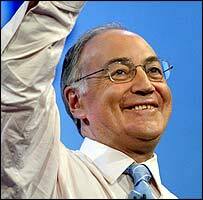 Michael Howard: Why was Britain the first western country to breed home-grown suicide bombers? "For years it has been taboo to question our society's record of integrating people of different colours, creeds and backgrounds. We were told that we had one of the finest records, bar the odd blip. That complacency was shattered by the London bombings. We had to face the terrible truth of being the first western country to have suffered terrorist attacks perpetrated by "home-grown" suicide bombers - born and educated in Britain. A good deal of soul-searching is in order about the role of minority groups in our society. Where should we begin?" A son of Jewish immigrants to Britain, Mr Howard writes that he is well-placed to say that it is perfectly possible to combine a strong sense of British identity with “a continuing attachment to other traditions”. Increased attempts to raise understanding of British traditions – notably “our democracy, monarchy, rule of law [and] history.” He recommends a two-way process whereby Britain also understands the beliefs of minority communities like those of British Muslims. Cultivation of the idea of the British dream. Mr Howard’s February 2004 ‘British dream’ speech was his aborted attempt to advance a positive, upwardly-mobile view of Britain. It was an obvious echo of the idea of the ‘American dream’. Mr Howard contentiously suggests that ordinary Britons are actually more likely to make it to the top than in today’s USA. I agree. It is taboo. However, Howard can't really talk because his grandparents entred this country illegally in the first place. The young Muslims in this country are naturally angered by scenes from the global media deamonizing Islam, and showing their fellow worshippers being tortured by our own men! During the course of affairs leading up to the wars in Afganistan and Iraq; Michael Howard and his fellow MP's gave Mr. Blair full support in parliament! Now he is whining about Blair failing to do the job, when he backed his decisions, from the start, in the first place! Britain does need to do some soul searching, though. Whether to back a slimey biggot, who has no concern for anyone, bar rich landowners and himself. Or someone else. Moreover; this 'man' has no concern for human rights for example, in the shameful cases of the Poll tax riots and the Criminal Justice Act. RULE BRITANNIA!